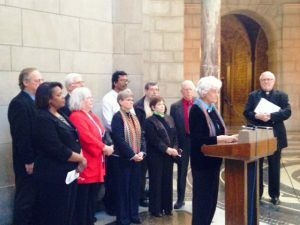 OTOC Faith Leaders joined with Nebraska Appleseed to hold a press conference on March 17, 2015 at the Rotunda of the Capitol to present the names of 175 clergy, women religious and faith leaders who are asking the Unicameral to pass LB 472—Medicaid Redesign. 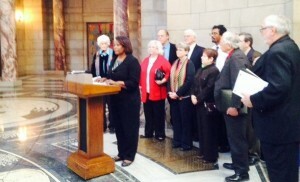 The Faith Leaders then took the letter to the offices of all 49 Senators and spoke with each Senator or their staff. A link to the Faith Leaders letter is available in the upper right corner of the OTOC website home page. Faith Leaders are still encouraged to sign on this letter. Rev. 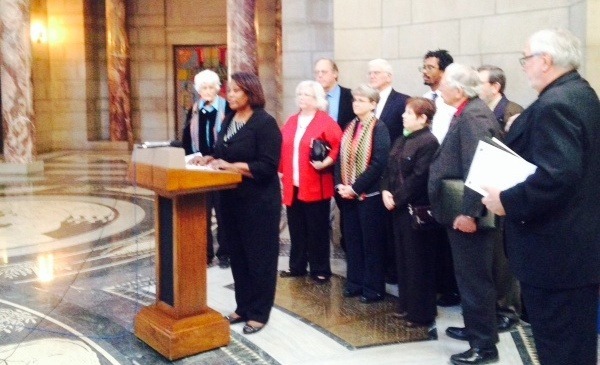 Vickie Parker, Pastor at Bethel AME Church in Omaha experienced the coverage gap for 18 months when she first moved to Omaha to become a full time pastor. She related how three of her kids qualified for Medicaid, but she and her oldest son had no coverage for 18 months. “Sunday after Sunday, as I stood before my congregation, unbeknownst to them, I was praying neither I or my son would get sick or require immediate medical attention,” Parker said. Sr. Kathleen Erickson, RSM reminded the assembled press that “We are our brothers’ and sisters’ keeper, wherever they may be,” Sister Erickson said. “This consistent ethic of life means that the Catholic Church has long taught that access to health care is fundamental to maintaining human dignity. Lack of access to health care is morally wrong, and must be addressed wherever possible.” Sr. Kathleen expressed pride that over 70 Catholic priests and women religious have already signed the letter in support of Medicaid Redesign.